Ken Follett, best-selling author whose archives are at Saginaw Valley State University. 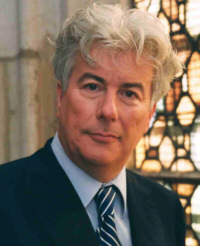 Best-selling author Ken Follett has made both big-time and small-town connections during the past four weeks. He made Oprah Winfrey's Book Club shelf, along with her 20 holiday favorite things, with his release, "Pillars of the Earth," written 18 years ago. On a far more in-depth basis, he also agreed to speak to graduates of Saginaw Valley State University, near Saginaw, Michigan, during commencement exercises at 7:30 p.m. on Friday, December 14. Why Saginaw Valley, one of the state's smaller state universities located 100 miles north of Detroit?" Because the school houses Follett's archives, a collection of 44,000 items packed in 29 boxes. And how did such a link form between a famous author and a small state university? The connection was created by Carlos Ramet of Saginaw, executive assistant to the president and formerly an English professor at the school, who wrote "Ken Follett: The Transformation of a Writer," published by the University of Wisconsin Press. Follett and Ramet (Pictured at Right) have a sort of kinship since both are from "across the pond," Narayan Radhakrishnan of http://www.RebeccaReads.com notes in a 2005 review of Ramet's book. Follett hails from Wales and Ramet was born a Brit. As a result, says Radhakrishnan, Ramet started to take an interest when Follett's "On the Wings of Eagles" -- the nonfiction account of a rescue mission to Iran during the 1980 hostage crisis --was transformed into a network television miniseries. H. Ross Perot, business tycoon and onetime Presidential candidate, had commissioned Follett to do the writing. Follett continued for a while in the thriller and espionage mode. But as Ramet notes from meticulous research, the author gradually began incorporating more effort into what became known as "a new kind of novel, the historical thriller." The transformation melded in 1989 with the support of Oprah Winfrey and millions of other readers, "The Pillars of the Earth." Now Follett was tracing his characters back to the medieval England of the 12th century, with a sweeping good vs. evil novel about the building of a Gothic cathedral. This was no comparison to his earlier thrillers. "Pillars" received rave reviews and was on the New York Times best-seller list for 18 weeks. It also topped best-seller lists in Canada, Britain and Italy, and was on the German best-seller list for six years. If Oprah and other Follett fans wish to dig deeper into the transformation that has made the author click, they may wish to invest in Ramet's 243 pages before they tackle Follet's 943 pages in his "Pillars" work. It sells for $15.95 paperback and $39.95 cloth-covered. University of Wisconsin Press can be reached at (608) 263-1110 or by e-mail, uwiscpress@uwpress.wisc.edu. Follett fans also may wish to did into his archives at Saginaw Valley State via svsu.edu/library/follett/exhibit2/vexmain2/htm. Follett explains his SVSU connection: "My papers are held in a collection at Saginaw Valley State University in Michigan, United States. 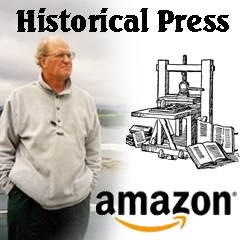 These include outlines, first drafts, notes and correspondence, original manuscripts and copies of early books now out of print. "This came about because Professor Carlos Ramet, now executive assistant to the university's president, wrote a book about my work, "Ken Follett: The Transformation of a Writer." "In 2000 I sent to him the accumulated records of my first 25 years as a writer. Some highlights of the collection include a typescript and published proofs of Storm Island ? republished as The Eye of the Needle, screenplays I developed for British television, and personal correspondence. This includes letters from Ross Perot during the time I was writing On Wings of Eagles (1983), based on the true story of a daring rescue attempt to free two of Perot?s employees from an Iranian prison during the revolution of 1979. "The library also has a comprehensive collection of my published works, including rare copies of books and short stories written under the pseudonyms 'Symon Myles,' 'Bernard L Ross' and 'Martin Martinsen'. "The archivist at the university, Jack Wood, has classified all these papers in approximately 4,400 files. There is an exhibition in the university's new library building of some of the items, and others are available to students in a virtual exhibition. "On 7 December 2004 we had a dedication ceremony and I presented a further document, the annotated first draft of Whiteout, in three ring-binders." Follett's latest novel, "World Without End" (2007) is the long-awaited sequel to "Pillars." This means the 58-year-old Follett will pick up a two-for-one good fortune with Winfrey's endorsement, and perhaps even more as fans dig back into his earlier works. "World" returns to the scene 200 years later, and features the descendants of the original characters. While Follett now enjoys fame, Ramet's book describes his difficult early years. Follett describes some of that early work as "pulp," ranging from science fiction to children's topics, and he has asserted that those were his apprentice years. Ramet reports that Follett wrote under such pseudonyms as Symon Myles, Martin Martinsen and Bernard L. Ross. As Saginaw Valley's Ramet prepares to greet Follett again for the December 14 graduation rites, it will not be a reunion of bosom buddies. In a 2005 interview with Radhakrishnan, Ramet explains that he didn't meet Follett until the author's 2004 visit to dedicate the archives, which was five years after "Transformation's" release. Ramet explained that he was writing not a biography, but a scholarly review, and he "did not want to be influenced by the personality of the subject." Upon their 2004 handshake Ramet described Follett as friendly and supportive. "He said he was flattered to have his works be the subject of such a careful reading, that he was possibly the worst possible judge, and so forth," Ramet told Radhakrishnan.